How to make a Successful Sales Career from Nothing? We are inviting all sales and marketing professionals or those who likes to understand how to convince effectively your target clients, for the first workshop in the Philippines under CEO Rebecca Bustamante Mills on July 9, 2015 at FullyBooked BGC Taguig from 2PM to 5PM. TAG Media & Public Relations Workshops Presents "Rebecca Bustamante: How to make a Successful Sales Career from Nothing"
Rebecca began her 20-year career in Canada. Her most recent position was Senior Sales Director for a large international cosmetics organization. Some of the many awards she received from the company over a period of years included: Top Rookie Sales Director for North America, Top 10 Unit Sales Award Canada (for each year of service), Top 10 Personal Sales Award Canada (for each year of service). Because of her success, Rebecca was regularly asked to provide training presentations for up to 500 people at national and international company functions. 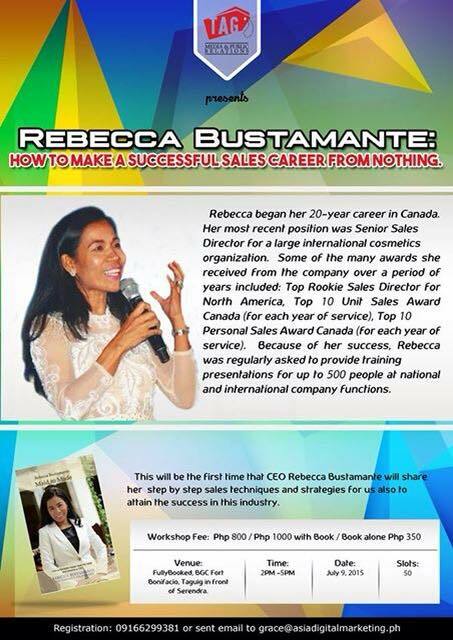 This will be the first time that CEO Rebecca Bustamante will share her step by step sales techniques and strategies for us also to attain the success in sales. TAG Media and Public Relations made this event affordable to help budding professionals to attend.